As the Sepang International Circuit hosts its last Formula One race for the foreseeable future, it certainly didn’t disappoint, and damn near beckons for the series to keep coming back. Sepang is the first track Herman Tilke designed in the late 1990s, ushering in a new design language nearly all modern grand prix circuits now employ. If it wasn’t for the Malaysian government deciding to no longer front the bill to host FIA’s traveling circus, we may still get to enjoy the double-DRS straightaway wonder for years to come. After the first turn debacle at Singapore in the previous race, the top three teams in the constructor’s championship mix knew positive results in Kuala Lumpur were imperative. This weekend’s race is round 14 of 20 for Formula 1, and the title races for drivers and constructors alike are tightening up. Lap records fell throughout practice and qualifying, with the 2017-spec cars obliterating records from when Fernando Alonso was still kicking everyone’s asses in Renaults in 2005. Mercedes put Lewis Hamilton at the front of the pack once again, extending his career record of poles won. With teammate Valtteri Bottas starting fifth, the Brackley-based duo sought a big extension to their already big constructor’s standings lead. Going into Sunday’s race at the steamy 3.4 mile course, Scuderia Ferrari’s hopes of a constructor’s title and Sebastian Vettel’s dreams of a fifth world driver’s title looked doomed. The German driver couldn’t set a timed lap during Saturday’s first qualifying session, and was relegated to the starting spot at the back of the 20 car grid. Kimi Raikkonen looked to be Ferrari’s best chance to bank some vital points, starting second. Red Bull Racing, fresh off signing a new deal with Aston Martin to be their title partner for the 2018 campaign, enjoyed seeing Max Verstappen and Daniel Ricciardo looking out row two, with odds to secure some of their most important points of the season. With Max being sandwiched between both Ferraris on the streets of Singapore before making it to turn one on the opening lap, he gained his seventh DNF of the season. Keeping the pace throughout the weekend was one part of the job, but the Dutchman desperately needed to finish in the points. A big finish at Sepang would also cap off his 20th birthday celebration in style. Scuderia Toro Rosso made a big change when they announced Daniil Kvyat was being given a two-race break, and offered 2016 GP2 championship winner and half a point out of leading the Super Formula series Frenchman Pierre Gasly his first race in F1. Kvyat has earned just four points this season, and the Red Bull junior team needs someone to lock up more constructors points. After being only .1 sec slower than teammate Carlos Sainz in qualifying, Gasly looks primed to jump into one of the Toro Rosso seats next season, with Sainz off to Renault while Honda power units head from McLaren to Toro Rosso, and McLaren getting Renault power for 2018 in one of the strangest driver-for-engine swaps we’ve seen in ages. Oh wait, it’s the only deal like this I’ve ever heard of. Before the lights even went out, something was wrong in the Ferrari garage. Kimi Raikkonen sat waiting in his SF70H as the team scattered to diagnose and fix what we learned to be a failure related to his battery pack. Vettel now the lone Ferrari left, he managed a miraculous 7-poisiton jump in the opening lap, from 20th to 13th. Max Verstappen made a solid start as the lights went out, quickly moving up to second spot in the first corner, right behind Lewis Hamilton. On lap two, max made his move into turn 1, snuck by Hamilton, and within a few laps, Verstappen found himself way ahead of the three-time world champion. After 56 laps, Verstappen took his second career checkered flag in his RB13, with a 12-second gap between he and Hamilton. 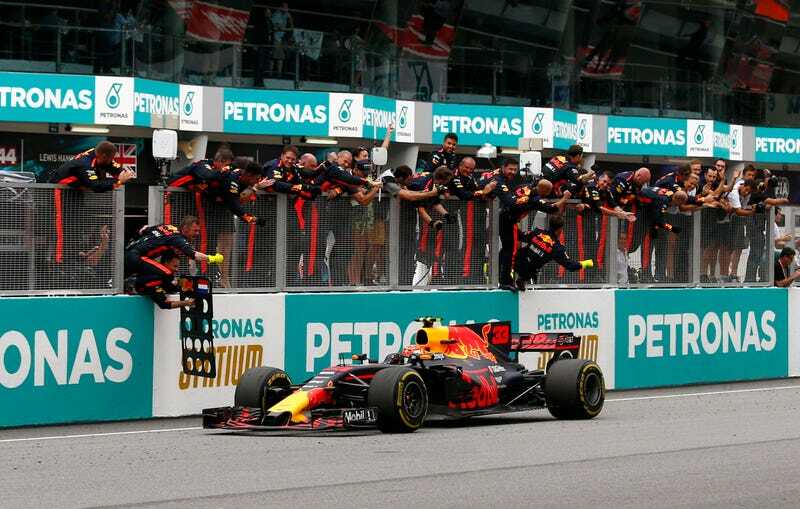 The result not only gave Red Bull Racing a big haul of constructors points with another double-podium finish this season, but most notably provided a huge morale boost to the Milton Keynes based team. As the race went on, Vettel pounced the field, working his way up to 4th. His heroic rush through the pack found him chasing down his former Red Bull teammate Daniel Ricciardo, only to have to back off his Ferrari’s Pirelli Super Soft tires were quickly degrading. No one could have bet on Sebastian Vettel to make such a recovery to finish with those 4th place points. With room to spare, Ricciardo pulled away to secure the third place spot and his 26th career podium. It wasn’t all smiles for Vettel, as he made his way back to parc ferme on the cool down lap. Williams driver Lance Stroll appeared to wander just off line in the pickup, and tagged Vettel, destroying the left rear corner of his Ferrari. What a terrible end to a fantastic day for Vettel and Ferrari. A massive 20th to fourth place run for Vettel. The second career win for Verstappen. Another podium for Hamilton and Ricciardo. 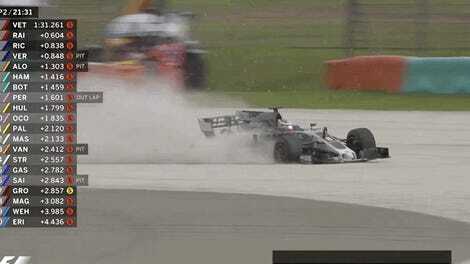 One insane crash on the cool down lap. In the end, what may prove to be the final Formula 1 visit to Malaysia provided fans with one of the most exciting races in its history. With just six races to go, Mercedes, Ferrari, and Red Bull will all be seeking to add to this momentum. We can only hope that the buzz of this race carries over to Suzuka, when round 15 finds us at the Japanese Grand Prix.